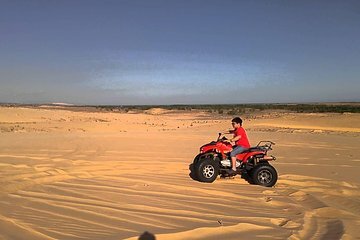 Traversez les dunes de sable rouge et blanc de Mui Ne lors de cette excursion de 4 heures en jeep. Des excursions au lever et au coucher du soleil sont disponibles pour que vous puissiez choisir l'heure de la journée à laquelle vous préférez rouler à toute allure dans le sable et visiter un village de pêcheurs et la Fairy Spring. This tour did not get off to a good start, even though our guide arrived on time 4.30am - sunrise tour, the jeep did not. It goes without saying that this tour is time critical, if you miss the sunrise we didn't - just then the purpose of the tour is missed. The jeep arrived at 5.10am, we had a 40km - break-neck journey to the dunes. Now bearing in mind these small, open jeeps have no seat-belts, this was one scary ride and made us quite nervous. When we got to the sand dunes we were told we would have to pay an extra 20 to hire a jeep to get us quickly to the top to see the sunrise, this was not mentioned in tour summary, we could have walked it, but we did not have the time as the jeep was late, but if we had argued, the sunrise would have been over again not a great feeling !! Putting all that aside, the sunrise was lovely and there was a carnival atmosphere to place, with people zooming down sand dunes on quad bikes, payable extra - which was mentioned. After the sand dunes we were taken to the red valley and also the blue lagoon fishing village of Mui Ne - both very interesting. Finally, we went to the Fairy Stream, where we had been told by other tourists there was a water-fall, we walked up the shallow stream which was nice, except for all the rubbish on the banks of the stream, but we could not get to the water-fall as the water was too deep. You have to go another way to get to the falls or be in your swim wear with no camera etc. The beauty of the Fairy Stream is marred by all the rubbish, given the popularity of this tourist attraction, I would have thought that the local trades people would want to keep the area clean, because it could be beautiful. In summary, had the jeep turned up on time we would have had a much better experience, the guide's English was not that great either, but he did try to recover the situation, as the problem was not his fault. The tour operator, Grayline Vietnam Threeland Travel just need to make sure they are on time.